Sometimes I realize how lucky I am living in Vancouver. There are quite a few burgeoning small companies here who make truly incredible plant-based food. I don’t just mean cheese substitutes and vegan sausages (although those are great!). I’m talking about businesses who see the importance of creating unique, whole food products that taste amazing and are actually good for you (something I’m passionate about). KAPOW NOW! is one of my favourite local companies. I recently met Tiffany (who founded the company) and totally fan-girled at her about her Nocheez Chickpea Crackers (protein-filled, savoury-tasting delicious little crackers). These things are gooood. Over tea, we decided to collaborate on a recipe using another of her products – Chocolate Glop. This is an incredible product: containing only cocoa powder, dates, sunflower oil, coconut oil, hemp, vanilla and salt, it tastes absolutely delicious and is like a healthier version of Nutella! I love that it contains fibre and iron but doesn’t contain any refined sugar. It’s great spread on toast or just eaten straight from the jar (yes, I’ve definitely done that on more than one occasion). 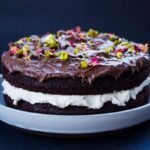 While thinking about what to make with the Chocolate Glop, I realized I’d wanted to create a good chocolate cream cake recipe for a while now, as I’ve been getting a bit fed up of buying vegan, gluten-free cakes that just taste of sugar and not a lot else. I’m so happy to have come up with one that I love, that actually tastes and looks like a ‘real’ cake, and that isn’t packed full of stuff that’s bad for me. Ground almonds, coconut oil and coconut sugar all help to give it a rich, well-rounded taste. 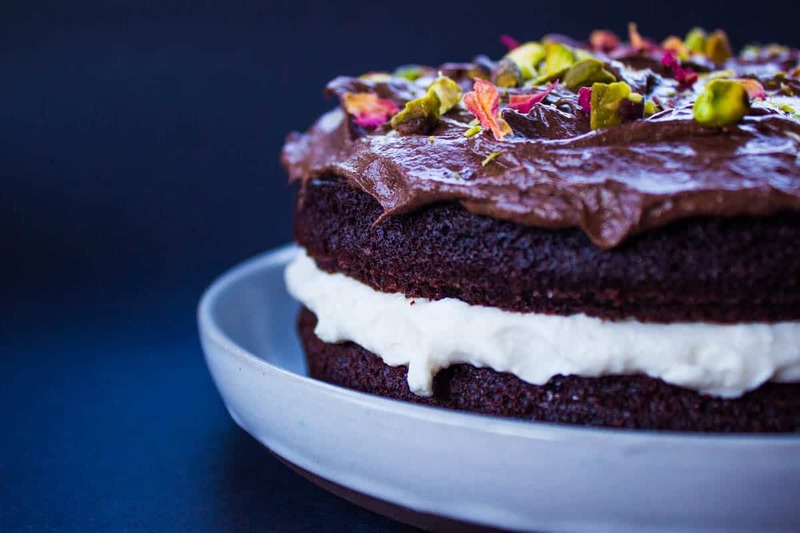 The addition of the Glop really finishes the cake off – it’s the perfect frosting (which is something else that’s a challenge when you’re trying to eat whole foods and avoid refined sugar). 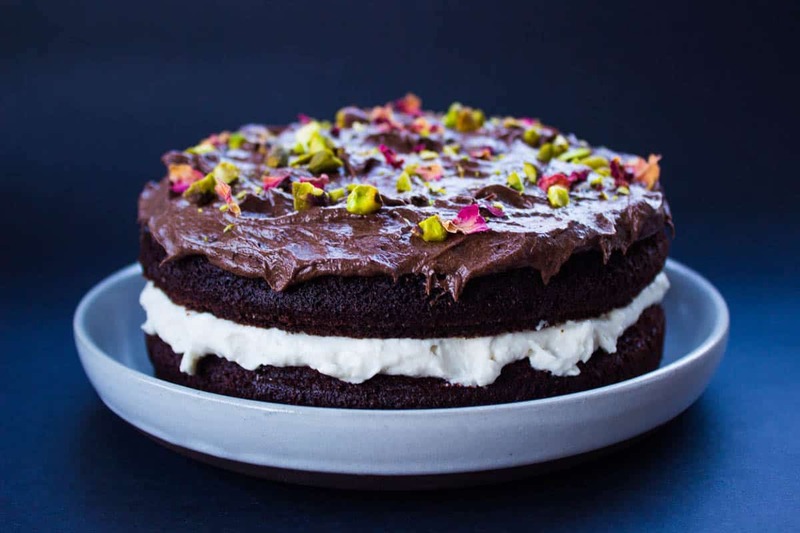 This chocolate cream cake is decadent, rich and a delicious treat and looks absolutely beautiful decorated with pistachios and rose petals. Don’t be put off by the length of the ingredients list and the recipe! This cake isn’t actually too complicated to make. That said, I do have a couple of tips: 1) use ripe bananas – they will mash much more easily. 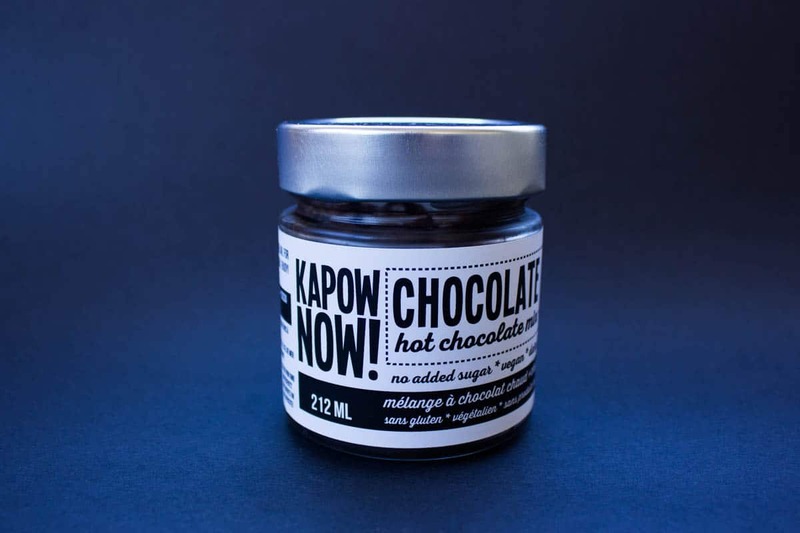 2) you can use cocoa powder instead of cacao powder – cacao just has more nutrients in. 3) follow the instructions below closely for making the coconut cream – this is probably the trickiest part of the recipe as everything needs to stay cold so it doesn’t melt. Grease two 18cm cake tins with coconut oil and line the bases with parchment paper. In a large bowl, whisk the flaxseed, coconut oil and maple syrup/coconut nectar until combined. Add the banana and almond milk and whisk again for several minutes until the mixture is smooth and airy. Add the coconut sugar, salt, baking soda, cacao, ground almonds, rice flour and vanilla and stir until mixture is combined and lump-free. Bake for approximately 35-45 minutes (until a knife comes out of the centre of each cake clean). Chill a large bowl in the freezer for 10 minutes. Using an electric whisk, beat the hardened coconut milk in the bowl with the maple syrup until the cream is totally lump-free and fluffy. Set aside ½ cup of this cream. Spoon the remaining cream in a thick even layer on top of the first cake, sandwiching the second cake on top of it. Using your electric whisk, mix the set aside ½ cup of cream with the ½ cup of Chocolate Glop. The Glop is pretty thick so it can take a few minutes to get a smooth texture. Spread the chocolate cream mixture over the top of the cake with a knife, forming small peaks and a rough texture. 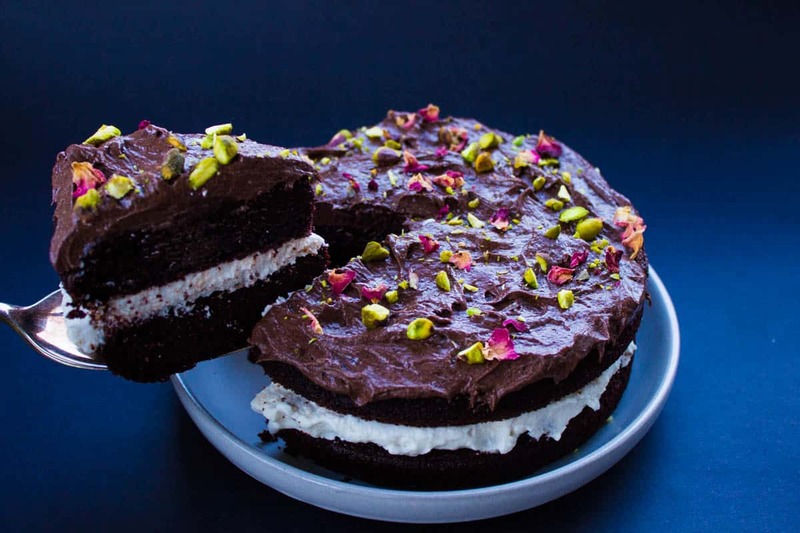 Sprinkle with rose petals and pistachios and admire!